I learned to take photographs with a ‘film’ camera, 24 shots per roll, and you didn’t know what the results would be like until the film was processed and printed a week later. F-stops, shutter speed, film ISO, exposure, focus, etc, etc. had to be learned and understood to take good photographs and then there were the darkroom procedures to be mastered. There was very little margin for error, your settings had to be 100% right, 100% of the time. Recently one of my sons and I were on an impromptu photographic outing. We both have sophisticated digital cameras. I still go through this same process as I’ve always done, and I produced 6 or 8 good photos from the outing. He took, maybe 500 or 600 photos – bracketed exposure, focus, etc. picked the best and ended up with 6 or 8 good photos, every bit as good as mine. With new technology, he knows enough to ‘get the job done’. He won’t regress. So whats the point? Its this, technology has moved in a giant step and its changing the world of art, and because we’re in it we can’t see it. Has Photoshop made realist landscape and portraiture painting obsolete? Has paint become a physical material to be manipulated into different shapes and textures, as paint, not as images of ‘reality’. Will today’s kids be bothered to learn the technically difficult art of realist landscape or portraiture? Are we the last of a type who had no option but to learn the technically difficult stuff in order to ‘get the job done’. The art is in the doing as much as the final result. Here’s the video of the painting from the previous post. See you soon. 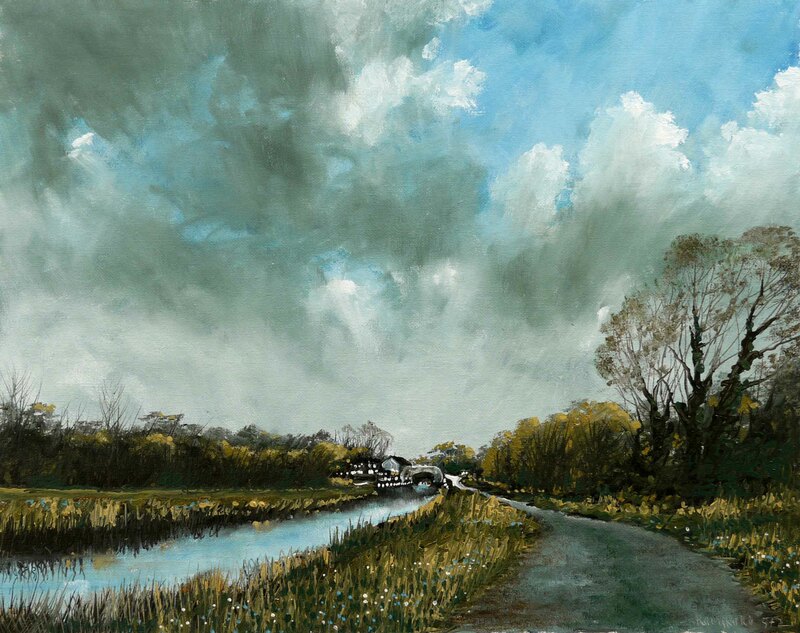 This entry was posted in Oil Painting and tagged Art, Culture, Education, Inspiration, Irish landscape, Oil Painting, Oil Painting Instruction, Oil Painting Landscape, painting, Pictures, Time lapse painting. Bookmark the permalink. I think that there’s simply more opportunity, more to learn, more inspiration. Physical painting will remain. Skills for those inclined, will always remain a challenge, something to strive for. The skills we acquire inform the technology we many choose to use, and the work we choose to make. I agree, but young people want ‘cutting edge’ technology. The young Impressionists in the 19th century wanted the latest technology – paint, ready made in tubes, wow! This lead to a revolution in art. The digital technology is said to be comparable to the invention of the wheel, as far as the impact on society is concerned. I wonder what revolution this technology will spawn in the arts. My first camera was a manual-focussing Zenith. I learnt the importance of depth of field which I doubt many modern casual photographers with fully automatic cameras fully understand its significance. Mine was a Practika. More advanced than the Zenith – it had through the lens light metering. Everything was manual after that. As I had a ‘good camera’ I was often asked to photograph important occasions. This I dreaded as I waited for the film and prints to be processed, wondering did I forget to do something important which would ruin the entire batch of photos. Oh the relief when the photos were OK, or most of them. Would I swap my GH1 for a Practika? Not on your life! When I see all the digital art on offer, I wonder the same thing: Will I, as an old school artist, become obsolete? I like to believe that brushes, paint and imagination will win the day. Only time will tell though. I feel obsolete already. I’m reminded of the introduction of electronic calculators in industry. I worked in a scientific laboratory at that time and I remember when one old guy retired we later found scraps of paper in his desk on which he had manually done his calculations, just in case the calculator was wrong. I see many younger artists coming through who are frustrated by modern technology and are actively seeking out traditional drawing, printmaking and painting techniques. They’re a minority but maybe that’s how it should be. There is great potential for artistic expression in the new technology. Unfortunately, ‘ugly’ is in fashion at the moment and this is what is what is being produced ad nauseam by leading artists. New technology is now synonymous with ‘ugly’. Hopefully this will change. I think you are right – we are in it and can’t see it clearly but there have been huge changes which have affected the way we do things and also our expectations. I studied photography for a semester at art school in the late 60s and didn’t ever get a real handle on it – a huge step from a box brownie to an SLR. Now I am a bit like your son, and take too many (I take them too carelessly). It is because we can that we do. Another version of the throwaway approach perhaps? Less intellectual application needed. Instant results. On with the next thing. oops, there’s the phone…. (not really). Funny, but these time savers always clutter our lives. First is was cleaning the magi-mixer (or whatever) now its sorting all those photos! I feel as if there IS a return to the basics – painting and drawing, but are my blinkers on? I will watch your time-lapse now – always love them. thanks! Thanks Philippa. I sometimes feel we are swamped in images. Thats why I think the actual act of painting is so important, hence the videos. A bit like performance art where the process justifies the end result. I’m delighted you enjoy the videos. Although I paint in acrylics, the film of your process is fascinating. The hand holding the brush – its twists and turns, the sketching and paint application. the decision making behind it all (so fast) but it’s happening right there. I also take my hat off to you for the extra effort that this kind of blog takes and salute you for your detailed text. Appreciation makes the effort worth while, thank you.